Sarah Dessen has mastered the art of crafting a quality contemporary romance / family drama novel. Her books are a mixture of substance and fluff - in a good way. The Moon and More is another solid hit. I often talk about how much I like Sarah Dessen. In actuality, The Moon and More is only the second book of hers I've read. I've jumped on the Sarah Dessen hype bandwagon. For good reason. Her books are a lot of fun to read. I liked Just Listen better than The Moon and More, but it's still well worth reading. This isn't a straight-forward romance. It's not really a romance at all. It's more a coming-of-age story. Emaline just finished high school. She's on the verge of making huge changes in her life and is torn between looking forward and cherishing what she has. The book is full of great characters. Emaline is inherently likable, although not a particularly complex character. I really liked the contrast between Luke and Theo, her old and new love interests. Luke is a good guy, but sometimes even relationships with great people fizzle out. It's clear to the reader that they are fizzling. Theo looks just right. He's a guy I would have jumped for at that age. He thinks Emaline is brilliant and wonderful and tries to help her become more. I really liked the twist that their relationship took, particularly because it's not standard romance fare. *Spoiler (highlight to read): Theo was a real jerk to Emaline at the end, but he still strikes me as a decent guy. Someone who needs to grow up. I'd like to see how he is around 25 once hopefully his head has deflated a bit. Family is the heart of this book. Emaline is lucky to have a loving family made up of her mother, grandmother, stepfather, and stepsisters. We see them squabble throughout this book, especially Emaline's snooty older sister Margo, but this is a happy family - something refreshing in the YA world. On the other hand, Emaline's relationship with her mostly absent dad is fraught with dysfunction. But even that is mostly the product of distance and social awkwardness rather than cruelty. The family dynamics on all sides felt nuanced and real. It is the reason to read this book - more than the romance. There are also well-drawn side characters. Emaline's friends Daisy and Morris. Clyde the artist. Ivy the ambitious, slave-driving, stereotypical New Yorker filmmaker was my favorite. It would have been easy to create a cardboard evil boss, but by the end of this book, Ivy is - not lovable per se, but the reader and Emaline have learned how to handle her. One thing that did bug me was how many characters, especially Theo and Emaline's dad contrasted East U and Columbia. It was as though Columbia was the Holy Grail and East U was a glorified high school. I went to a state school. I would have loved to go to a private university, but I think that you can get the same quality education at a state university as an Ivy League school if you make an effort. Thankfully, this viewpoint changes as the book goes on. The Moon and More is a fun, light read. It doesn't break any new ground, but it's fun nonetheless. If you're looking for an epic romance, you should probably go elsewhere. But if you like a character driven novel and strong family plots, this is the book for you. I do love a book that focuses on family and doesn't shove them to the side, as so many YAs do (or get rid of them altogether!). Sarah Dessen is definitely a favorite writer and I need to read this book...maybe I'll convince our librarians to order it so I can snag it! I'm happy that you are reading Sarah Dessen's books. I adore Just Listen. It's my fave. And I love that this book family is involved. You don't see that in most YA books Great review. I love Sarah Dessen books too! :) Haven't read this one yet but thanks for the great review! I got on the Sarah Dessen bandwagon a bit late too. I actually read my first book of hers for my YA class in library school. I've been a fan ever since. I haven't gotten a chance to read this one yet but plan to do so. I really liked this one too. I agree with what you said about Theo. I loved the family dynamics and I really like the balance this has. It's not fluff, but it's not terribly heavy either. It's not a romance, but has romantic moments and has a lot of growing up experiences. Just an all around great read! This is the first Dessen book I've read and while I thought it was fun, I also thought it was longer than it needed to be as well as kind of unfocused. I think I'll try JUST LISTEN next, as I've heard lots of good things about that one. 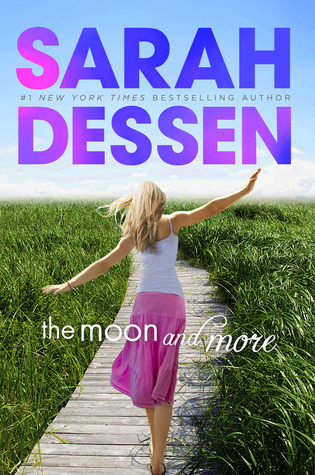 I can't believe you haven't read more Dessen! You need to check out This Lullaby and The Truth About Forever-I personally think those are her best!